The University of Asia and the Pacific is highly committed to admitting the best students and providing increased access to quality higher education. University of Asia and the Pacific also provides other forms of financial assistance to qualified students applying or enrolled at the University. University of Asia and the Pacific shared a post. 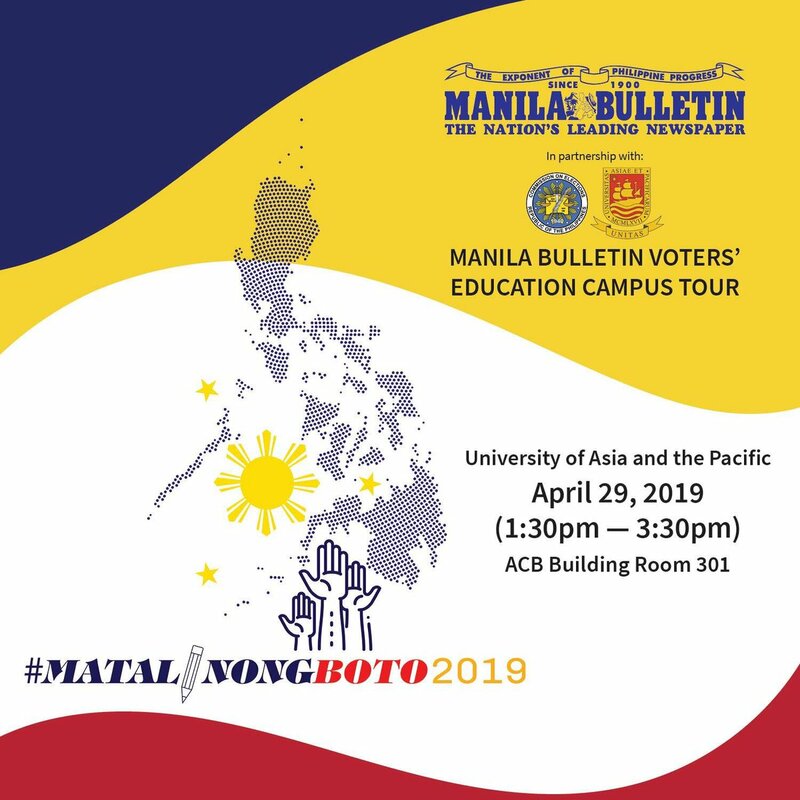 The UA&P School of Law and Governance invites the UA&P community to the MANILA BULLETIN Voters' Education Campus Tour on April 29. University of Asia and the Pacific with UA&P MScM. UA&P Professional Schools has not stopped in delivering innovations to set us apart. 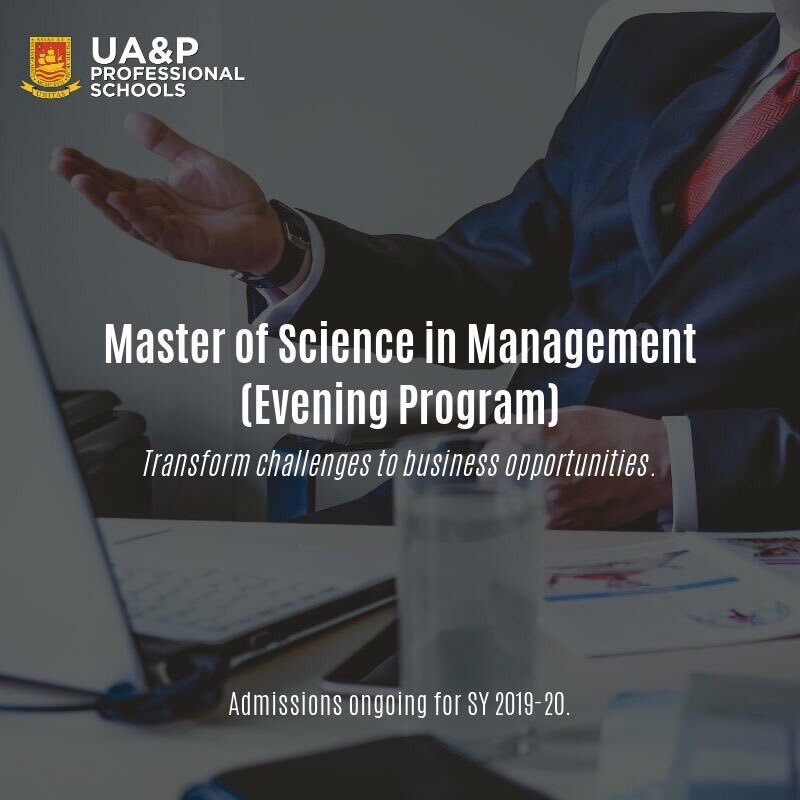 For one, their offering, Master of Science in Management (MSCM), is a program that readily responds to what is usually a tall order to corporations: training top leaders-to-be, and training them well in a short span of time. The course is a great aid in the process, allowing its students to learn the ropes of managing well—within just a 2-year timeframe. With classes conducted in the evening, the program is indeed suitable to the demands and load of the future leader. For sure, MScM is a ticket—for corporations and individuals alike—to managing challenges, and transforming them into wins. MScM is currently accepting applications for SY 2019-20. To learn more about the curriculum, admission requirements and other info, please visit our page: go.uap.asia/mscm-evening-program. UA&P has long been regarded as an institution to trust in the delivery of business economics education. For several decades, we have mentored numerous business leaders. But we’re taking it a notch higher. This coming AY 2019-2020, UA&P will launch the Ph.D. in Business Economics Program—the first of its kind in the country and our very first doctoral degree offering. We highly encourage eligible participants to apply for our pioneer batch. 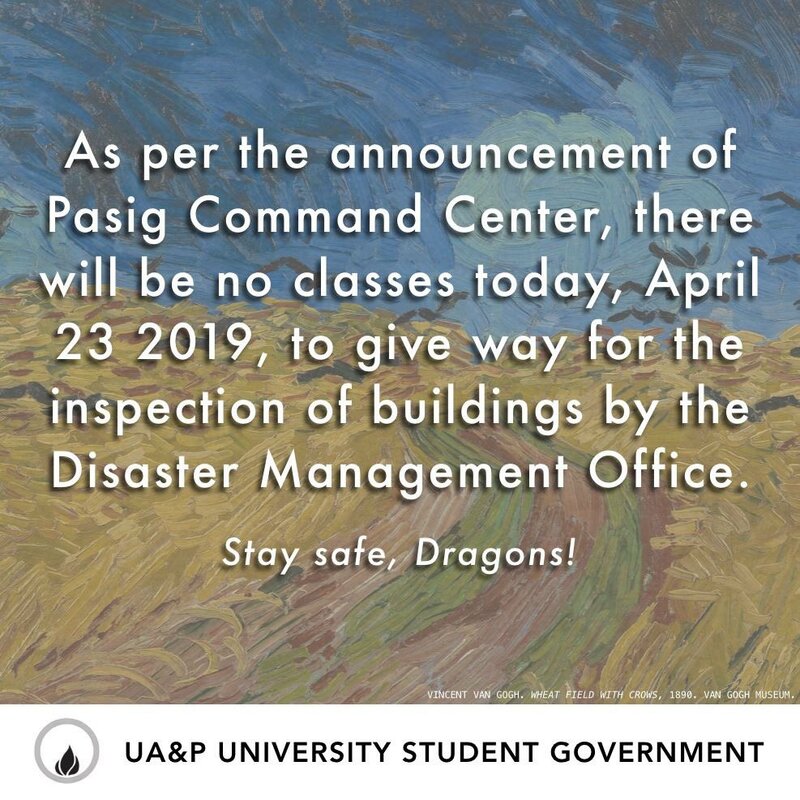 City Government of Pasig and Schools (PUBLIC and PRIVATE) are SUSPENDED today April 23, 2019 (Tuesday) to give way to the engineers and other deem team to check the buildings for possible damages, EXCEPT department that under of Disaster Management Offices. This is an automatic solution.
. .thinking of the students who live in condos and multi-level dorms who have not settled yet since the earthquake, as well as the paralyzed / disrupted / limited means of some transport systems . . will the students affected, be excused from classes? Aren't you cancelling classes tom??? For inquires, call Mr. Michael Asuncion at (02) 637-0912 local 368. MScM is a ticket—for corporations and individuals alike—to managing challenges, and transforming them into wins. We currently accepting applications. Visit https://t.co/Zw8uOnGYHo or contact (02) 637-0912 local 243, or mscm@uap.asia for info. UA&P launches the Ph.D. in Business Economics Program, our very first doctoral offering. We encourage eligible participants to apply. For program info, visit https://t.co/iuhmsUQeSx. For inquiries, call (02) 637-0912 loc 372 or e-mail Dr. Jovi Dacanay, at jovi.dacanay@uap.asia. To apply to University of Asia and the Pacific course programs, applicants should be Graduates of foreign and Philippine high schools accredited by the Department of Education (DepEd) may be admitted as freshmen into the University. Personal essay (typewritten on short bond paper) that conveys interests (visual/theater arts, sports, music, gourmet cooking, etc. ); accomplishments; family, educational, entrepreneurial, and social experiences; future goals; strengths, weaknesses and potentials that positively contribute to the development of the University (maximum of 250 words). Parents’ information sheet — for Entrepreneurial Management Program applicants only. Accomplished scholarship / financial aid application and recommendation form for those applying for grants. The University accepts transfer students from other universities and colleges accredited by the Commission on Higher Education (CHED) who are willing to start again as freshmen. 2 letters of recommendation from professors or teachers who know the transferee well. Three 2″ x 2″ identical pictures (one for the application form and one for the exam permit). Photocopy of NSO-authenticated birth certificate.